"Let's go around the circle and introduce ourselves." "Hi, my name is Max. I'm a writer, artist, musician, and public speaker. I live in a van with my cat, Fermat, and I am Autistic." "Oh, Max, I don't think you should call yourself autistic. Labels are for soup cans, not people! You're such a sweet, intelligent man. You don't need to use that label on yourself any more. We all accept you here. You're just like us and seem totally normal to us. Don't label yourself." In my opinion, labels are valuable tools. Labels help us to find other people with whom we resonate. How many dating sites would people bother with if you couldn't use labels to tell prospective dates that you identify as: male, female, (on more enlightened sites, there are more gender options), Jewish, Neopagan, Christian, atheist, agnostic, Muslim, Buddhist, etc. ; African-American, White, Asian, Native American, etc.;. smoker, non-smoker, and so on. Those labels are crucial if people are to find dates with the sort of people who "ring their bell," and so they can try to form intimate partnerships with them. Imagine trying to find a date on a site where all the people were just randomly jumbled together. Labels help us to find groups with which we click. I wouldn't have studied Morse code if I weren't able to label myself as a ham radio operator and find other people who also call themselves hams. I would have missed out on a lot of great friendships if people from the Rainbow Family refused to use labels and didn't call themselves Rainbows. People use labels all the time when they are seeking groups with which to associate. Labels help us to understand ourselves better. Yes, they are a sort of heuristic, meaning an imperfect, short-hand, and reductionist way to identify things that doesn't necessarily encapsulate the entirety of who and what a person is—but they are so useful. A woman who notices her stomach getting bigger and bigger is comforted by remembering that she is pregnant. Pregnant is a label. When I get frustrated that I have to slowly reason out people's words and actions, and cannot interpret them immediately and on-the-fly, it comforts me to remember that I am Autistic. Autistic is a label. We've all heard someone say—either joking or seriously—"that's because I'm a man," or "I feel this way because I am transitioning," or "that's because I'm a woman," or "it's because I'm still a kid," or "come on, I'm a grown-up!" or any variety of these. Man, trans, woman, kid, grown-up—all labels. And all useful. Abandoning labels is well-intentioned because it tries to seek to avoid harming others. But it can cause more harm than good. I view the drive to abandon labels as a close relative to person-first language, which also arose from good intentions, and which de-emphasizes labels out of respect for personhood (e.g., "person with autism"). Both seek to assert one's humanity in the face of something considered dehumanizing and horrible. But that's the problem: We don't find people insisting on person-first language for conditions considered positive or neutral, like being an artist, musician, male or female, etc.—people only get cranky about the "person living with Thingness" construction when being a Thing is assumed to be something terrible. Likewise, people who say that people shouldn't be labeled ("labels are for soup cans, not people") have no problem with labels like "man," "woman," "artist," "musician," "writer," "Nobel Prize Winning Physicist," and so on. They only pull out their anti-label rhetoric when they are cringing about the particular label a person has been given, or has given to themselves. Now, when that label is a genuine pejorative someone else is using to restrict or hurt a person, it's great to fight labels. Many people reading this have fought hard to wipe out the R-word, and I love you all for that! But when someone has embraced their label and is proud of it and feels that it conveys important information about their identity—like "Autistic," for example—it is a painful squashing of their identity to refuse to accept their label. When we don’t allow people to label themselves, we are denying their autonomy. We are saying they don’t have the right to decide who they are and present that self to the world. We are treating them like little children who don’t know any better. In some ways, it's even worse than person-first language. Person-first language says "I want to separate you and your autism and put you first to remind people that you are a human being because autism is such a terrible thing that they might forget you are human if I don't linguistically separate it from you." Anti-labeling says, "I want to deny the existence of your autism altogether. It is inherently dehumanizing so I want to use language to pretend it out of existence entirely." 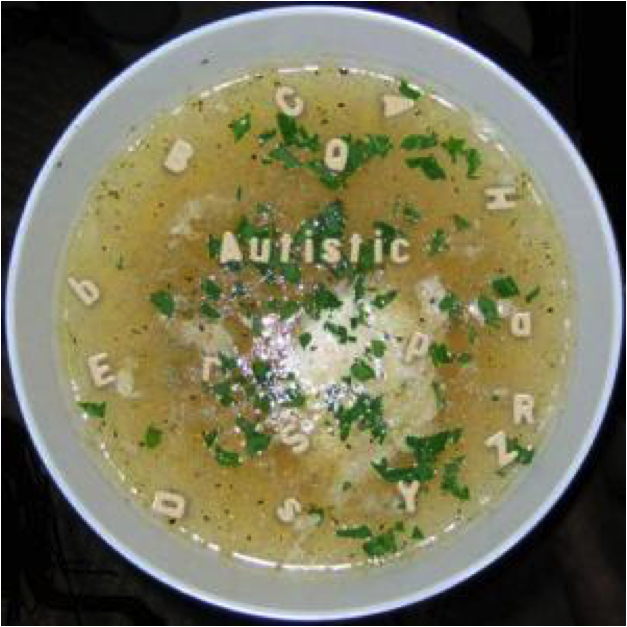 Closely related to the “labels are for soup cans” comment are the comments like, “don’t allow autism to define you.” But it doesn’t matter what I do or don’t allow—every cell of my body, from the genetic code in my DNA to the neurons in my brain are autistic. Autism defines me every bit as much as being human defines me. If you don’t think there’s anything wrong with my “allowing” being human to define me, then please don’t try to tell me I shouldn’t allow autism to define me. If someone is being bullied with labels and definitions that other people are forcing on them, it is great to step in and stop it. But when someone trusts you enough to share a core piece of their identity with you, it is a slap in the face to tell them that labels are for soup cans, not people. When you say something like that, you are trying to keep the soup and throw the can in the trash. I am Autistic and if you try to throw that in the trash with the soup cans, you are throwing me in the trash and it hurts. Enjoy my soup (I think it's tomato-basil soup. I hope you like it) and learn to accept my label without cringing because I love my label. Autistic is who and what I am. Yes, it is a heuristic—I am so much more than that word. But if you reject that word, you are rejecting me.